Tangy summer sausage is very similar to the regular but with more zing. Another benefit is it is shelf stable and is great for meat baskets and gifts to friends. 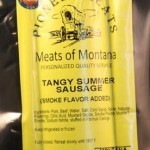 Talk to Pioneer Meats in Big Timber, Montana for fundraising ideas using this product.